The Treasury plans to raise the VAT and cut the wages of civil servants in order to reduce Israel’s deficit. The Treasury plans to raise the value added tax (VAT) and cut the wages of civil servants in order to reduce Israel’s deficit. According to the Treasury’s proposal, the budget for 2013 will be cut by 14 billion shekels, and the 2014 budget will be cut by an additional 6 billion shekels. The budget for 2013 , excluding debt repayment, will be 296 billion shekels, and in 2014 it will grow to about 304 billion shekels. The Treasury plans to impose most of the budget cuts in the next two years on the wages of civil servants, according to the proposal published on Wednesday evening. The wages will be cut by 2% to 3%, and this move will be achieved by postponing salary increases that civil servants were promised in contracts that have already been signed. The VAT is expected to rise by 1% and stand at 18%, according to the Treasury’s proposal. As well, the Treasury plans to cut the defense budget by approximately 3 to 4 billion shekels, the child allowances by 3 to 4 billion shekels, and investments in infrastructures by 2 to 4 billion shekels. 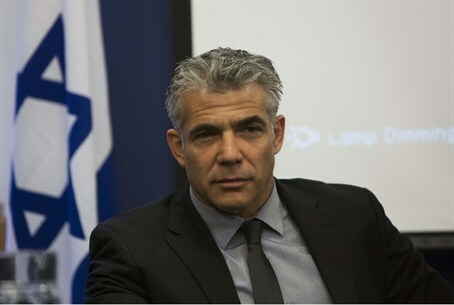 Finance Minister Yair Lapid and his team are scheduled to meet Prime Minister Binyamin Netanyahu on Thursday and present him with the available options for the budget. Netanyahu has the final say on which measures to adopt and bring before the Knesset to a vote. Lapid has already ruled out raising tuition fees for university and college students and cancelling the income tax credit for working women, which would have raised the state’s incomes from taxes by about 700 million shekels. The Finance Minister has come under criticism in recent days because of the planned cuts. About 300 people protested on Saturday night outside Lapid’s home, holding up protest signs which read "fund public housing immediately" and “stop living in a fantasy". The protesters were also upset at comments Lapid made on Facebook, in which he defined the Israeli middle class as 'Riki Cohen' from Hadera, who works as a high school teacher, while her husband holds a mid-level position in a high tech company. Together they earn about 20,000 shekels a month, enough to allow them to travel abroad on a low-cost tour package once every two years, but nowhere enough to enable them to help their three children buy an apartment. However, this example is of a couple in the top 20% of earners, and Lapid faced heavy criticism by Israelis over the post, since many Israelis earn much less. On Tuesday, Lapid was slammed by members of the opposition, after he failed to show up for a Knesset session over the planned measures, choosing instead to send Deputy Finance Minister Mickey Levy but still finding time to post a Facebook status while the session was going on.